Description: An easy to add all Facebook friends to any Facebook groups in single click 2017. 100% Working method not using scripts. Hello friends! I am again back with a cool Facebook trick that lets you add all of your Facebook friends to any Facebook group in one click after invite all friends to like Facebook page at once 2017. You may also find the script on internet to add all of your friends to groups, but most of the scripts are not working because Facebook updates their website regularly. I recommend you don't use any script on your personal or promotional Facebook account as your account will be in high risk as scripts run over all your Facebook friends. We will use here, a browser extension that has the limit for your friends to be added in groups at once. Keep in mind, never use any tool or trick again and again at the same time otherwise your account will be locked. Try the tool or extension once and use it again after 24 hour for your account safety. Therefore, here is a cool trick to add all your Facebook friends in any group at once 2017. Open your Google Chrome browser, and click here. It will open in a new tab. Click on +ADD TO CHROME button, and again click on "Add extension". The chrome extension will start installing. After complete installation +ADD TO CHROME button will now be converted into ADDED TO CHROME button. You have successfully installed 'Group Invite All Friends 2017' add-on in your chrome browser. You don't need to restart your browser. It will auto place into the browser toolbar as shown in the following screenshot. Now, go to the Facebook group in which you want to add friends. Click on 'Group Invite All Friends 2017 icon', you will see a popup window like the following preview. 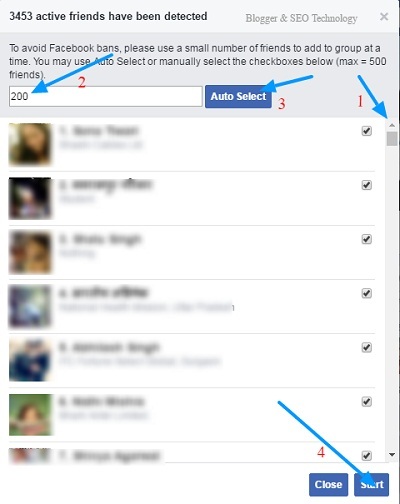 Make sure you scroll (Look point 1 in the above screenshot) the Facebook friend list to sufficient amount so that the corresponding checkbox be loaded otherwise the checkbox will not be checked, and friends will not be add in the desire Facebook group. (Look point 2) Write the number of friends that you want to add in single click. The extension suggests don't add more than 500 friends, but I would recommend you don't add more than 300 friends at a time. You may wait next 24 hour to process it again. Now, click on 'Auto Select' button. All the checkbox will get checked automatically. Now, finally click on 'Start'. 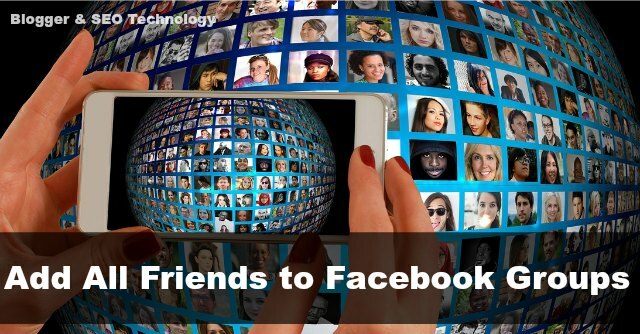 Wait for a while, you will get how much friends have been added into your Facebook group. Recommendation: Repeat this process again after 24 hour. To get more tips and tricks on Facebook, follow us, subscribe blog. Thank you!